for $79,900 with 3 bedrooms and 2 full baths. The lot size is 100X58. Just in time for Spring! 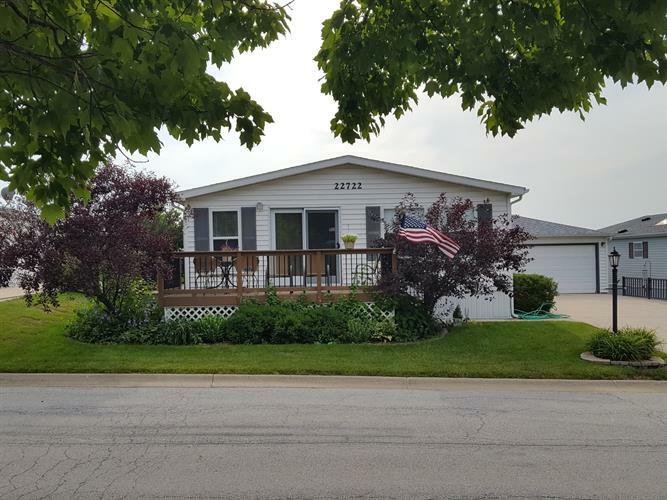 Come take a look at this Spacious 3 bedroom Shamrock double wide in Gateway Park, Frankfort's premier adult 55+ community! Gorgeous wrap around maintenance free deck with access to the back yard area, great spot to sit and sip a cup of coffee or glass of wine! Open concept kitchen with tons of cabinets! Spacious living room and dining room combo with vaulted ceilings. Nice den off the kitchen for extra TV Room space! There is a large laundry room with extra storage. Master Bedroom Suite with Private Full Bath and walk in closet! This home has multiple skylights for an abundance of natural light. Over-sized garage has plenty of storage space and just steps from your door! Newer water softener and brand new air conditioning. All appliances stay. Move right in and relax!